Specifications as per National & International Standard. By keeping track with up-to-the-minute market developments, we are engaged in manufacturing, exporting and supplying a high quality range of Precision Turned Bushes. Our range of Precision Turned Bushes has low-friction coefficient and can be used only a trace of oil. Moreover, our range of Precision Turned Bushes has low vibration and creates less noise. Turned Bushes require high accuracy manufacturing. We recognize the requirements of its applications and deliver precise products. Our Turned Bushes are manufactured as per customer specifications and are provided in machined as well as pre-machined sizes as required. We take extra care that these bushes serve the purpose well and provide longer life than normal. Satyam Precision Components Pvt. 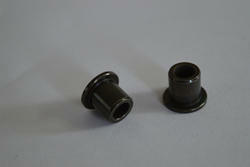 Ltd.
We are among the reputed organizations, deeply engaged in offering an optimum quality range of CNC Turning Bush.